Woodgrain finishes are one of our best-selling options, and our woodgrain finishing process is a unique aspect of our vinyl windows and patio doors. Our woodgrain process was created by Eugene Lang and is exclusive to Lang Exterior. How Strong is the Lang Woodgrain Finish? Probably the first question about any woodgrain is durability. How strong does it hold? The knot you see below was designed to prove the durability of our woodgrain process. Originally, this knot was a straight piece of vinyl, which was then placed into a 450 degree oven. 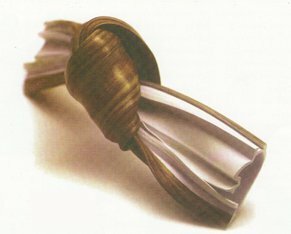 As you can see, our woodgrain can be subjected to extreme heat and yet still maintain its form even when tied into a knot. The material did not crack, peel, or tear. A woodgrain that strong can actually be put outside the home not just inside! Our green exterior vinyl windows actually shows this, using a green woodgrain finish, not green vinyl, and this finish is created using the same process as our woodgrain interiors. While strong enough to withstand extreme heat as well as the elements outside a home, inside the home what people notice is beauty, a beauty that surpasses any other woodgrain process for windows we know of. And because our woodgrain covers every visible inch of the interior, our vinyl windows may have more of a wood look than many current real wood windows. Lang has you covered for matching trim! Our unique woodgrain process can also be applied to wood, so we also manufacture custom made interior trim to perfectly match the woodgrain of your window. 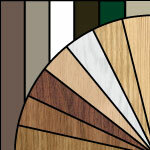 And our custom trim is available in a variety of profiles to suit any decorative taste. 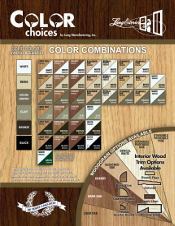 Make sure you include matching trim when you order a woodgrain window from Lang. Finally, how easy to maintain is our woodgrain finish? An important consideration since vinyl windows should mean easy maintenance. Our woodgrain interior finishes are actually easier to clean than vinyl, meaning that beautiful vinyl window and woodgrain can be kept looking as beautiful as the day it was first installed.